We offer a variety of options on the Volkgurdy. This page and the pages explaining the specific options will help you to choose the ones that are appropriate to your playing level and style, your budget, and your future plans for your instrument. If this is your first hurdy-gurdy, we strongly advise you to limit your choices. 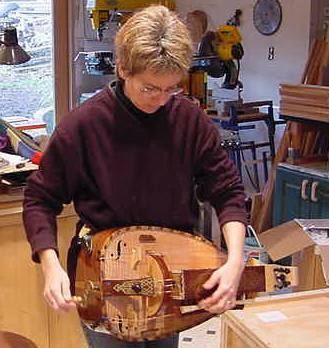 First-time hurdy-gurdy buyers tend to think, "This will be my only hurdy-gurdy, so I should get all the bells and whistles." This may seem like a good idea, but it's better to start with a simpler instrument and upgrade to a more complex hurdy-gurdy as your playing ability increases. It's not necessary to choose from the options when ordering - we will contact you to confirm your choices when we start building the instrument. While prices on most of the options you choose will remain stable while you are waiting for your instrument to be built, some (such as amplification and tuners) are subject to changes in the market, so the price of the option may change by the time your instrument is begun. We will do our best to keep these price changes to a minimum, and you may decide not to include the option if you inform us of your choice before we start building. To see explanations of the options, click on the titled link on that option. Soundboard: Western bigleaf maple is the standard choice. Options include Sitka spruce, Spanish cedar, and others. Body wood: Western bigleaf maple is the standard choice. Options include black walnut, claro walnut, Honduran mahogany, and a variety of specialty hardwoods. Trim pieces: These are the pieces that are on top of the instrument: the keybox top, the wheel cover, the tailpiece, and the wheel cover blocks. Western bigleaf maple dyed black to look like ebony is the standard choice. Options include black walnut, ebony veneer, and a variety of specialty hardwoods. These pieces are the most likely to be decorated with custom inlay. Peghead inlay: The standard inlay is a quatrefoil rose. A number of alternative inlays and carvings are shown in the options page. Custom inlay: The standard choice is that the instrument is unadorned except for the peghead inlay. A variety of inlay examples are shown in the options page. Some decoration ideas that we have thought of but haven't gotten to try yet are described in the Flights of Fancy page. Soundboard edging: This is also called the binding. The standard choice is a set of plaques of a single wood or alternating woods, with a line of purfling inside it. The options include a variety of special materials for the plaques or in place of the purfling. End cap: The Volksgurdy typically doesn't have an end cap, but one can be included if desired. Sympathetic strings: The standard choice for the Volksgurdy is without sympathetic strings. The option is for either four or six sympathetic strings. Tuning mechanism: The standard choice is mechanical tuning machines. There are several options, including traditional friction pegs. Amplification: There are several options for amplifying the hurdy-gurdy. Electronic tuner: This option allows the instrument to be tuned without hooking up a seperate tuner. Tuning: The standard is G/C or D/G tuning. Optional tunings are available. 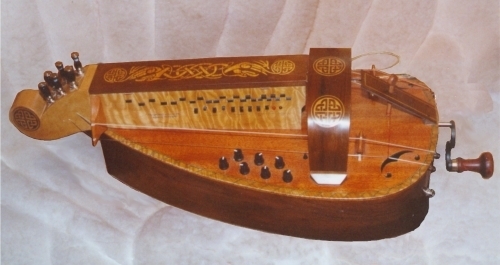 Third chanter: The standard Volksgurdy has two chanters, with an option for a third. Tangents: The standard option is a set of locking metal tangents, with an option for the traditional wooden flag style. Keyfronts: The standard is curved keyfronts, with an option for traditional straight keyfronts. Tangent wrench: This option is for a custom hex driver with a wood handle that fits in a recess under the peghead. Drapeau: This drone capo or pair of capos are not included on the standard Volksgurdy. Strap locks: The standard Volksgurdy has wood strap buttons, with an option for locks which can't come undone accidentally. Case: A soft case and a hard case are options for this model. Bearing adjustment tool: This tool allows the player to adjust the tightness of the tail bearing. Flights of Fancy: This page describes ideas we've had for the instrument that we haven't had an opportunity to try yet. See if one of them is the hurdy-gurdy you just can't live without. For the prices on these options, see the pricelist. Please contact us if you have comments or questions about this page or any other page on this site. Beati illi qui in circulum circumeunt, fient enim magnae rotae. © Copyright 2000 - 2005, Olympic Musical Instruments. Please ask for permission to use material from this site. Thank you.